Home » Digestion » 16 Warning Signs Of Poor Digestion That Everyone Ignores! 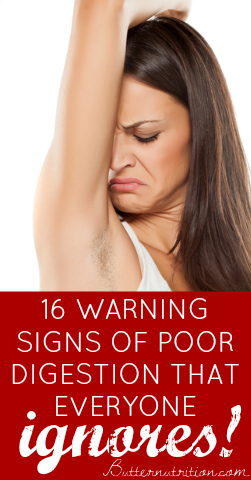 16 Warning Signs Of Poor Digestion That Everyone Ignores! By Catherine on February 6, 2013 | Last Updated October 5, 2018 | 52 Comments | Medical Disclaimer | This Post Contains Affiliate Links - I may receive a commission if you purchase through links in this post. There’s not much worse than chronic bloating, which leaves feelings of heaviness and unease in your stomach for hours on end. You know, the kind that makes you not want to get dressed in the morning, go out and socialize, or do the activities you normally love? 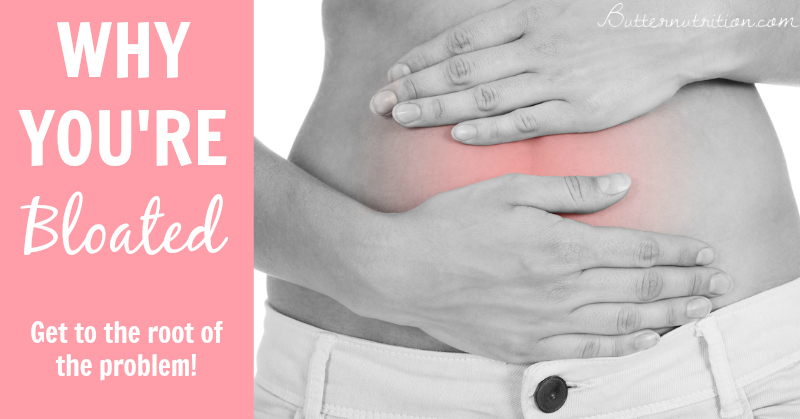 Keep reading to find out why this bloating occurs, and how you can get to the bottom of it and improve your digestive health! All of these “symptoms” are indicators that your stomach is not producing enough stomach acid! Why is stomach acid so important? It’s the first line of defense in your body’s digestive cascade; responsible for sterilizing the stomach, killing unwanted invaders, breaking down proteins, and stimulating proper digestion! Without this powerful acid (ph of 1.5-3 that could burn a hole in your carpet), food is left to ferment in your stomach, and then it continues to cause havoc as it works its way through both your small intestines and large intestines. As you can imagine, these improperly digested particles cause irritation and sometimes damage to the delicate environment of the digestive tract, leaving you feeling bloated in the process. Undigested food can even act abrasively on your tissues (think sandpaper) because they are not broken down completely. Over time, this can lead to food allergies, digestive disorders, and eventually autoimmune diseases! Why are you so low in stomach acid? The standard American diet is plagued with processed foods and unnatural fats with little to no nutritional value. All these things contribute nutritional debt in the body, especially a deficiency of the mineral zinc, which you need to produce powerful stomach acid! Low stomach acid can also cause you to become malnourished over time (even if eating a perfect diet)– because your body is not able to create the highly acid environment that is required to absorb vital vitamins and minerals. Calcium, zinc, and B vitamins are just a few examples of nutrients that require strong acid for absorption. Common dieting and food restriction are other probable causes of bloating because it tells your body to SLOW the metabolism dialing DOWN your digestive juices over time. A slowed metabolism can also be confirmed by a waking temperature of less than 97.8 degrees. Another important and often overlooked factor is issues with your liver and detoxification. In many ways, the liver governs the digestive system. When the liver is sick from either protein deficiency or malnourishment, the bowel environment feels “poisoned.” This can make the digestive system very sensitive, which can cause constipation, diarrhea, food allergies/sensitivities, and pain; the whole spiral of digestive disorders. How do you go about increasing stomach acid to get rid of that bloated feeling? A perfect place to start is with these two simple tips on how you can increase your stomach acid instantly at any meal. Beyond that, if you want to banish bloating for good, you must focus on a multifaceted approach to up-regulate your metabolism and address your nutritional debt using with real food therapy. Complete recovery from bloating is absolutely possible and obtainable if you are ready to start understanding your body and what it needs! 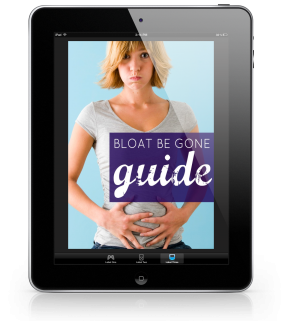 Ready to address kiss your bloating goodbye right now? Enter your information below to get immediate access to my bloat-be-gone cheatsheet! Are you bloated? If so, what helps? Please share in the comments! Weatherby, Dicken. “Liver and Gallbladder.” Signs and Symptoms Analysis from a Functional Perspective. Nutritional Therapy Association, 2004. Print. It would be helpful to mention, also, that taking a Betaine HCl supplement with meals can help increase stomach acid in the meantime, while you are healing. This also helps to balance the intestinal flora somewhat. I used to use HCL in my practice, but I’ve stopped. Instead I use the right nutrient dense, easy to digest foods to up-regulate metabolism and digestive juices. HCL can cover up the underlying cause of poor digestive juices, so while it may feel like it’s helpful, it doesn’t help the underlying cause of a nutrient and cellular energy deficit. What nutrient dense things are you using? Thanks! Please, help this family with a proper diet to help digestion . I’m diabetic 2 on insulin and I’m on Senna and 2 sachets a day fibregell not pooped for 3 weeks I love my vegetables I eat a lot of them feel very tired after a meal go to bed and sleep for a very long time no energy at all got to have a ENDOSCOPY and fast a lot longer than the first one I had feeling bloated all the time my wheight is about 16stone please can you help me,I can’t pass wind or belch. I can not hardly swallow I feel as I’m chocking.got Reflux.and under active thyroid .thanking you. I’ve heard that senna damages the muscle function of the bowls for moving food along. Is there something else that might work, such as magnesium? I used to use senna tea during cleanses and stopped after I learned this. Interesting article with some more good things to note! One of the most important, but very simple things I do to help my digestion is to eat more hot foods and broths. I eat a lot of legumes (lentils, beans, peas) and I’ve noticed how much better I digest them when I eat them in a hot form rather than cold, and the more real warm broth with them the better. Eating cold food, especially starches, makes the body work harder/slower. My typical breakfast each morning is a chicken broth base soup with beans, chopped greens or seaweed, garlic and poached eggs in it. If I decide I’m in a hurry and eat something cold for breakfast, gas is likely to plague me throughout the day. I’m not discounting the benefit of raw foods, like lettuce, cucumbers, etc. which I eat frequently with positive results – more referring to the detriment of cooked foods eaten cold. And even cold meals, like a salad, seem to work better when paired with some hot broth, soup or tea. I totally agree – I’ve stopped eating cold foods and drinking cold drinks altogheter and my stomach is so much better! I’m going to start my day off like that. In fact, I have bone broth on my fridge right now. Thank you for posting this! I had to re-share. Great information! Hi Jennifer! Michelle Canty here! I read this blog, too! I hope you’re doing well. It’s been too long since I’ve seen you! I have another question about HCL supplements. Is it ok to use temporarily for fixing bad digestion due to mercury toxicity? Im detoxing mercury and i think its messing with my digestion and gut flora. I get bloated after I eat anything and lately heartburn. I’m not familiar enough with mercury toxicity protocols to address this. I only use whole food based methods to increase the natural detoxification process in my practice. I have suspected that I have low stomach acid for awhile, but my diet is pretty good currently, I think. Here’s a brief overview: I ate a typical American diet throughout most of my life (low fat yogurt, low fat wheat thins, lots of packaged products, etc.). I also struggled with an eating disorder during high school. I started a more traditional diet about 2 years ago (I’m 25) and now there are very few processed foods in my house. I’d say 90% of what we eat on a regular basis are “real foods”. We eat raw milk, lots of butter and cream, sourdough bread, eggs, seafood occasionally and and mid-line amount of meat. Anyway…about 1 year ago, I figured out my iron stores were really low (6) and was put on ferrous sulfate. Then, in January, I developed gastritis (had the upper endoscopy and everything) and was told to take Prilosec. Against my better judgment, I decided to take it short term (I was in a LOT of pain and could barely eat sometimes). Gastritis went away after a few months. During this time I stopped the iron pills in case they were a contributing factor. Here’s another weird thing: I got lots bloodwork done several times during all this gastritis mess and my eosinophils were super high and stayed elevated for several months. So, I was referred to a hematologist for that. Then the eosinophils actually went down (no idea what caused it), but the hematologist found that my ferritin was still really low (around 6 or 7) and put me back on iron pills. However, they never helped. After a good number of months on them, my ferritin was not up at all, hemoglobin always hovered around the lower end of normal, white count was low as well. So, about two weeks ago I had an iron infusion. Thankfully, I am starting to feel more energetic from that. So, I don’t mean to tell you my whole life story, but I’d love to get out of the yo-yo of weird health stuff. The doctor never offered an explanation as to the cause of my gastritis, so I’m not sure about that. But, I’m sure taking the Prilosec didn’t help with the anemia and probably hurt stomach acid production. I do have a bottle of the Betaine HCL that I’ve taken occasionally, but I haven’t started taking it regularly yet. Are there any quick tips you can give me? Like I said, my diet is pretty good and traditional, although perhaps I’m a little heavy on grains. Are there any specific foods I should eat more of to increase my stomach acid? Or should I take the Betaine HCL temporarily to help out? What is DE? Thank you! My father is 72 and has all of these issues. He has cleaned up his diet considerably over the last few years but his doctors have kept him on several acid reflux medications because his acid reflux is so bad that he often has to have pre-cancerous cells scraped from his esophagus. If he goes off medication even for a day he has violent vomiting. He is terrified to try this protocol because of the immediate pain and agony going off his meds causes. What do you suggest to someone like this? It’s a thiamine and niacin deficiency that’s causing the loss of HCL. Niacin and Thiamine are both B vitamins that are depleted by sugar, excess estrogen, sulfite food preservatives, tannins in chocolate, tea and coffee, and bacteria found in mushrooms, shellfish and pork. Once you start supplementing, if may take the body a few weeks to a few months before HCL levels return to normal, but understand that once you start ingesting foods high in sugar, estrogen (whole milk), or food preservatives, your thiamine levels can quickly become depleted again. The best sources of thiamine and niacin are the organ meats of grass fed animals such as liver, kidneys, heart and thymus glands. Brown rice and whole wheat flour are also good sources, but chlorine in water will also bind thiamine so that your body cannot absorb it. Also, any type of yeast infection or yeast products secrete a substance known as thaiminase which destroys thiamine. Drugs such as pain kills, antibiotics, birth control, diuretics for high blood pressure, anti-depressants all deplete thiamine from the body also. Read a book called DRUG MUGGERS for more info. One last thing; there are now strong correlations between heart disease, diabetes, and thiamine deficiency. If you decide to supplement, look for the type of thamines that contain TTFD (Thiamine Tetrahydrofurfuryl Disulfide) which is the far more absorbable form than the B1 thiamine hydrochloride tablets found in stores. They also made TTFD supplements in cream form which has been shown to vastly improve babies and children with autism which is also linked with a lack of gastric acid. Absolutely agree with your statement. Another relatively recent finding about thiamine deficiency is that Multiple Sclerosis (and some other AI illnesses) symptoms closely reflect thiamine deficiency symptoms, and correcting a thiamine deficiency may alleviate/eradicate many MS symptoms. Also, the Allithiamine form of thiamine may be the most effective, while the benfotiamine form is also well utilized, and may work best to address neuropathy, and taking magnesium and the good form of vitamin B6, P5P, along with thiamine may make the difference between strong uptake and poor. Some additional reasons why our thiamine status is so poor in the US include the fact that modern wheat and/or corn has an enzyme in it that blocks thiamine uptake in ruminants and/or humans, which may be one reason why MS and other disorders improve so dramatically when gluten and gluten mimicking foods are taken out of the diet, along with the healing activity that occurs during a gluten free diet regimen. The consumption of modern wheat/corn alters the digestive balance of bacteria, causing disbiosis. I concur, great info Rachel! In some cases (like mine) it may be H. Pylori leading to low stomach acid. More protein and bone broth from Amish chicken have been helpful with the addition of digestive enzymes/betaine HCL for now. I’m hoping my acid levels will return to normal with a healthy diet after the Pylori is dead. Anyway, figured I’d mention it in case someone who hasn’t tested for it (Metametrix Gastro test found it!) is reading this and has IBS/CFS, etc. despite trying everything. Soft drinks also make gas in my abdomen. I now do not take soft drinks and even ask my family members to avoid these beverages. Lies. I’m taking PPIs BECAUSE I produce too much acid. Apple cider vinegar diluted in water, for instance, burned my throat to nearly 911 levels. Just because people are experiencing these symptoms does not mean they are simply producing too little stomach acid. It burns you because your membranes are weak because of bacterial overrun and inflammation and acid reflux damage to the throat which causes lack of nutrients, you need to soothe it and get the acid in there so you can absorb again and restore your levels, which will heal the damage, which will allow you to tolerate a normal acid level. Tl’dr – If you can’t even handle vinegar, something is wrong. I am not sure all the symptoms listed to identify poor digestions are absolutely correct. I suffered sever heartburn and indigestion, plus my adrenals were trashed. My GP explained it was because I was producing too little acid, and he explained we needed to get my body proceeding more bile and the right enzymes. So, he sent me to a nutritionist who put me on a vitamin detox for 40-days, during which I ate 7 meals per day of organic fruits and loads of leafy green vegetables and drank 2l (6oz) of water. No dairy and no meat. I also had to drink 2 x cups of a bitter herb tea to stimulate bile production (which was a bit hard to drink at first). during the first 3 weeks I suffered the expected detox symptoms…headaches and diarrhea. But after the 40-days I felt absolutely amazing, My digestion was the best it had ever been. No more for heartburn, lethargy etc. What was interesting is after my digestion improved I actually lost the taste for meat and haven’t touched it since. I also don’t crave sugar like I used to. Who is your doctor ? I would love to see him. Hey! omg, so i always crave Vinegar and googled just to see if it meant anything….glad i did…so i am currently 30 and when i was 26 i had my whole large intestine removed and recreated with my small intestine. in both your articles i read about craving acidic foods they are legit dead on. bloating, predigested food, belching….going like 10 mins after eating…before you say its from the surgery, I have been belching like this and going since as long as i can remember….should i be worried or assume it comes with the territory of the j pouch procedure…. I cant believe you mentioned VEGAN DIET as a Negative thing that affects digestive problems! im sorry, but seriously.. do your research! people switching to vegetarian or vegan diets find they HEAL all the problems from the Standard American Diet. really,, Vegan should not be on this list. its mis-information and clinically incorrect. Vegan diet may be the best for some, but not others. I was vegan for 5 years and it ended with me having a host of issues. So to say that Vegan is better because the ‘Standard American Diet’ is unhealthy is a very vague response. First, what exactly is the ‘Standard American Diet’? Eggs? Cheese? Butter? Meat? Chicken? Fish? Fruit? Cereal? Sugar? The term ‘Standard American Diet’ does not take into consideration how a food was produced, packaged, prepared, served, digested (or not digested), absorbed, excreted, etc. Eating an unfertilized chicken egg produced by a hen that lives on a family farm and is free to roam can be a very healthy choice. However, it can be very unhealthy to eat an egg from the very same breed of chicken who lives in a tiny wire mesh cage on a factory farm, receives no sunlight or fresh air, is fed GMO feed filled with toxins, and is then pumped full of hormones and antibiotics. So what exactly types and qualities of foods are we talking about exactly when we use the term ‘Standard American Diet’? Plastic-like Velveeta slices can technically be called cheese, but is that the same food as a finely crafted, raw, organic artisan cheese? We need to be careful about what we recommend others to eat or not eat. Yes, I know a lot of Vegans who swear by their diet and seem to be faring better than the McDonalds crowd. However, I also know a lot of very fit, beautiful, strong, and high energy people who eat tons of organic grass-fed meat, free-range chicken, raw grass-fed butter, and drink raw milk. And yes, they also eat tons of green veggies and starches like sweet potatoes. So REAL FOOD appears to be the key to health and vitality. I just want to say that sometimes the best diet in the world will not help with stomach acid production.I had major surgery followed by severe digestive problems.Many days when I only drank water.I finally found a dietician who helped me start to eat,but my stool was full of undigested food,plus gas,heartburn etc.I was eating an excellent diet,we tried vinegar,vitamins,etc with no success until I started taking the HCL….hopefully,I will start absorbing zinc and thiamine and my stomach acid will normalize. If you are currently on a vegan diet would introducing animal by products (cheese, yogurt and eggs) help with low stomach acid? I cant bring myself to eat meat again but would be open to switching to a vegetarian diet. I’ve been having major problems over the past few years that I thought was my gallbladder but I had an ultrasound and it’s super clean. My doctor wanted me to take prilosec but it just didn’t make sense to me. I’m always in fear of eating because I don’t know if I’m going to be ok or in pain afterwards so I tend to skip meals. Any insight would be really helpful. Thank you. Wait, ‘Vegan diet’???? The exploitation, slavery and mass-murder of animals will not help your stomach acid. Try eating an apple, drinking water, not eating bread, but c’mon, what a load of horse manure! I have several of the symptoms mentioned. and a recent Cat Scan found hypo density on the lower lobe of liver. You advised to do Phase I and then move to Phase 2 for liver detoxification. How soon to I switch from 1 to 2? Or do I eat a combination of 1 & 2 on a daily basis? Thank you … this information is very helpful in my recovery…. THANKS FOR ALL THE COMMENT IT WILL HELP ME TO START FROM SOMEWHERE TO CURE MY OWN PROBLEM I LOVE YOU ALL! I just wanted to add another note to my comments above on thiamine and niacin deficiency being the cause for low gastric acid levels brought on by over eating sugar, pork and other toxins in the environment. If a thiamine deficiency is what is causing the massive animal die offs to occur in our fish and bird populations, could this be what is also causing everyone’s ill health and disease in the human population? I’m just wondering what the correlation is if any? When you have poor circulation, immune system cells that are needed to fight off infection may not be delivered as quickly or in great enough quantities as they would be via a healthy circulatory system.